In the September 26th issue of Globe their cover story features Prince Charles’ wife Camilla Parker-Bowles, 64, Duchess of Corwall. Blazoned across the cover ‘Camilla Storms Out!’ The magazine claims that Camilla is on her way to New York City and she is demanding a $20 million home after a huge fight with Duchess of Cambridge, Kate Middleton . Apparently the whole fight is because Camilla is unwilling to accept Kate as Queen. Globe has more: Following a blazing bust-up with Prince William’s new bride Kate, furious Camilla stormed out of the palace with plans to move from England to New York. 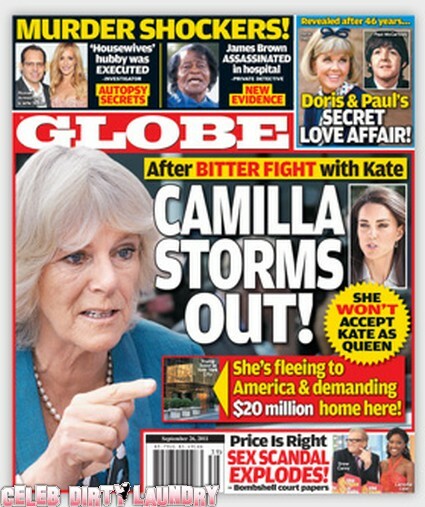 Read in detail the nasty barbs Camilla spewed at Kate and the outrageous ultimatum she issued to hubby Prince Charles – all in this week’s GLOBE. The magazine also features Doris Day. They claim Doris has been having an affair with Paul McCartney for 46 years. No doubt this story is because Doris’ Day’s comeback album has broken records in the UK. Doris recently had Paul at her home in Carmel, California. Paul said about her new album “I think your fans will go crazy with it. It’s a nice album with beautiful emotions.” So of course Globe has jumped to the conclusion that Doris and Paul are having an affair. Just pure speculation by Globe to sell magazines. Star Magazine: Kate Middleton Pregnant With Twins!